The Tonto Apache Tribe is located adjacent to the town of Payson (originally named Te-go-suk, Place of the Yellow Water), in northwestern Gila County approximately 95 miles northeast of Phoenix and 100 miles southeast of Flagstaff, Arizona. Consisting of 85 acres, its the smallest land base reservation in the state of Arizona. 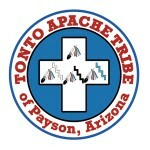 The total population of the Tonto Apache Reservation is approximately 140 of which 110 are enrolled tribal members. 102 members live on the reservation (Tonto Apache Tribe, 1994). One-third of the tribal members are under the age of 16 (BIA, Indians of Arizona, 1994). The Tonto Apache are the direct descendants of the Tontos who lived in the Payson vicinity long before the advent of the Anglo. The large Rio Verde Reserve, near Camp Verde, was established in 1871 for the Tonto and Yavapai Indians. The Reserve was dissolved in 1875 when they were forcibly moved to the San Carlos Apache Reservation. Some Tontos gradually returned to Payson after 20 years of exile to find white settlers had taken much of their land. Today, legislation is pending which will provide them trust title to the land upon which they reside. Tribal members are well known in the art community for their outstanding bead work and basketry, which have won them national recognition and can be purchased on the reservation. As a result of the small size of the reservation, there are no significant geographic features within the reservation and natural resources such as timber and minerals are quite limited. Elevations range from 4,975 feet to 5,115 feet. However, the reservation is surrounded by a variety of major land forms. The Mazatzal Mountains are located to the west; the Sierra Ancha Mountains are to the south; and the Mogollon Rim to the north. The Mogollon Rim, just minutes from the reservation, offers beautiful pines, lakes, streams, camping and hunting. The winter snow provides unlimited skiing, snowmobiling and even cross-country snow shoe racing. On September 3, 1994, the Mazatzal Casino opened for business. It is a 35,000 square-foot casino which includes over 300 slot machines, a poker room, a 300-seat bingo hall, restaurant, sports lounge, gift shop and arcade. The casino is one of the largest employer in Payson, Arizona, employing over 300.